I finished reading Princess for Hire by Lindsey Leavitt a few days ago. It was supposed to be a quic read but I got too busy during the holidays that I ended up reading it in a couple of days. Anyhow, I really enjoyed reading it and I'm waiting for it's sequel from The Book Depository. I ordered a lot of books during the holidays. Unfortunately, I haven't received any of them yet. 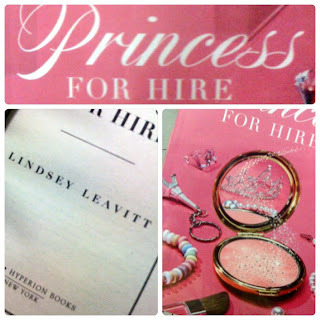 The novel is about the Facade Agency and Desi Bascomb who happens to have the dream job of every girl in the world. And yes, that is to be a substitute princess for all of the royals out there. First of all, I really liked Desi. I like her for being such a non-conventional girl. Yes, she's a princess substitute but that doesn't make her a damsel in distress type of girl. Though I did want to smack from time to time since she has a crush on this guy and I absolutely have no idea what she sees in him at all. Anyway, I think being a princess substitute changed her for the better. Overall, I enjoyed reading this book though I'd probably recommend this to the younger audience. It was really short though. I think it could've been extended or something. The writing style is very simple and very understandable which is good since this makes it easier for the younger audience to understand. It reminded me of Meg Cabot's The Princess Diaries. I haven't exactly read any of the novels yet but the movie kinda' reminded me of this novel. Anyhow, it was lacking in some elements but it is truly enjoyable and I can't wait to get my hands on the second novel in the series. I'd give this a 4/5 star rating just because of its cuteness factor. Desi sounds great. Glad you enjoyed. She is. She's soooo adorable and she's probably one of those characters that I just can't hate.